The last two weekends in a row I've attended regional SCBWI events. First, Los Angeles Writer's Day, then, Santa Barbara/Ventura's ARTbeats, a portfolio workshop for illustrators. It's always stimulating to emerge from hibernation. The creative process, whether writing or painting - is a sort of self-imposed solitary confinement. It's reassuring to encounter other people who are living in the same peculiar state of voluntary exile. I didn't get around to posting Writer's Day highlights. The week after was consumed in a frenzy - much of it dedicated to preparing my portfolio for ARTbeats. It seems a bit late to rehash Writer's Day now. If you missed it, Lupe Fernandez wrote a most entertaining post about it here Pen&Ink. Not too late for a report on ARTbeats though. This program, organized by Carol Heyer, exceeded my expectations. The first speaker, Martha Rago, gave an overview of her role as associate creative director at HarperCollins. She discussed some of the main qualities she looks for in children's book illustrations - point of view, a distinctive style and voice. Hmm, you might say, many of the same qualities editors covet in writing. This makes sense - the art in children's books exists to augment the story. Illustrations should form a visual narrative, a sense of character and action. "A cute idea isn't enough for a picture book," Rago said. 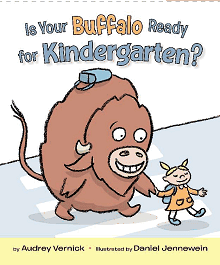 Walking us through the process of marrying art to text, Rago used the example of an upcoming picture book, Is Your Buffalo Ready for Kindergarten? written by Audrey Vernick and illustrated by Daniel Jennewein (Balzer & Bray). We saw the steps - from initial character studies and revisions - to final art, and learned what went into strengthening the illustrations and propelling the visual narrative further. For example, the book was made richer and more dynamic by adding visual props, details and relationships between secondary characters - none of which had been alluded to in the text. The artist did character studies for all the secondary characters to make them consistent - even though they were in the background. Rago explained how this added to the sense of the story being a real world, made it more credible, richer, real. As we all know, it's not enough to be a good illustrator - or writer. That's where marketing comes in. Dave Tabler, director of sales for theispot.com, an illustrators' database, shared numerous gems on gaining exposure. He started with the basics - registering your own domain name and mailing postcards - still a worthwhile marketing tool for illustrators - as evidenced by Martha Rago herself, who earlier showed us a photo of the postcard-festooned bulletin board in her office. Consistency - a cohesive style is important - so art directors will be confident they know what they're getting if you're hired. Try to convey character through gesture and expression. It's not just about color, space, and graphic style. The art should be intriguing - make you want to know more about the scene. The details should be clues that reveal more about the story in a nuanced way. You don't want technical aspects - like a problem with perspective - to detract from the narrative. Consider the focal point - lead the eye by making anchor points in the image. You need a map, logic in your illustration. Successful picture books have touches for adults too - references kids wouldn't get. The palette should suit the emotional mood - e.g. somber colors for a somber mood. Use stronger colors to make important characters stand out, more muted colors for less important characters. The underlying message was a comment by Martha Rago: "Be thoughtful about every choice you make in your drawing and painting." I walked away inspired and recharged. Not a bad idea to surface and shuffle your perspective once a week. "If you missed it, a fellow blogger wrote a most entertaining post about it here Pen&Ink." Thanks for the plug. I admire your ability to paint. Alas, my drawing talents consist of stick figures. Great blog and post about ARTbeats day! Mentioned you in my blog post today! Thanks for the comprehensive report on ARTbeats! We had a great team, led by Carol Heyer, and terrific speakers, as you addressed so well! Great to see you too at the Schmooze. Thanks for stopping by Totally Writeous. I'm glad I discovered your blog. It's jam packed with great info. Glad you enjoyed ARTbeats. One of my crit. partners is on the board and helped plan this; she'll be thrilled to read your post! Hope I meet you at an SB or LA event one day.